A magic wand? Well, no, but some of our patients like to refer to our K-Laser therapy services as such. For patients that aren’t able to enjoy their once active lifestyle due to intense pain, relief through laser therapy can be a godsend. We know quality of life is important for everyone. If you aren’t able to work, travel, or enjoy everyday activities like sitting at the movies, then that’s an issue. The Creekside Chiropractic team is passionate about pain management, natural healing and helping our clients live the active life they love. For those reasons and so many more, we are proud to offer K-Laser, a drug-free state-of-the-art pain management and natural healing therapy that allows our patients to get back to their active lifestyles quickly. Are you experiencing pain from an injury, an intense sport competition, the stress of daily activities or natural aging? Our K-Laser therapy can help! K-Laser utilizes infrared wavelengths for targeting healing in specific areas of the body, even difficult areas such as the hip and spine. 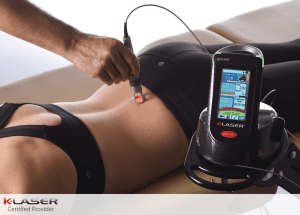 It is the only Class 4 therapy laser that utilizes these three infrared wavelengths, allowing for deep penetration into the body, providing for reduced pain and inflammation, along with enhanced tissue repair and increased range of motion. Did you know your body has an innate desire to heal itself? K-Laser is a unique non-pharmaceutical solution that helps our team target the cells that lead to natural healing. Through stimulation, the body’s natural healing process is encouraged and pain is reduced. Ready to set your appointment and see how laser therapy can provide for quicker healing and bring back your active lifestyle? Let’s chat.